I'm not a fan of Halloween. Did that shock you? Didn't think so. Dressing up in silly costumes, asking for candy door-to-door while trying not to freeze, or as the case this year, get soaked. Nope, not my cup of tea. But this is the first year all the kids have had a real clue about Halloween and been in the States to enjoy it. We carved pumpkins, twice: the first ones a couple weeks before Halloween turned into moldy piles of goo on the doorstep, as did the second ones done a week before the big night. 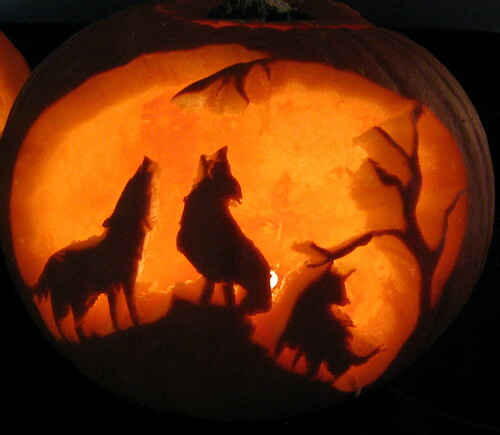 But here you can see Katherine's masterpiece the day she carved it. I'd bought 3 enormous bags of candy plus Halloween pretzels and some odds and ends like chocolates wrapped in fang wrappers. We live in a neighborhood filled with kids, the elementary school is only a couple blocks away, I worried it wouldn't be enough. Our largest stainless steel pot (our "cauldron") from India couldn't hold it all. The boys went trick-or-treating with Ian so for 45 minutes there was no one to man the candy dispensing. That was probably the downfall right there, we have so much candy left to gorge on. Ian took them up and down the streets and noted what Nicholas later admitted himself: He'd rather hand out candy than trick-or-treat. The boys had a good time, but as anyone who knows Nicholas will confirm, he'd prefer to just stay home. He wasn't comfortable in his costume and going up to strangers' doors is not his cup of tea either. Here's a tiny "yay!" from mom. The candy part was OK with him and I'll agree with that, but having a bowl of it at home is just better than begging, you know? Jonathon didn't like his face mask, you'd think he would have thought of that before going as Darth Vader, but the rest of it was right up his alley. Oh well, win some, lose some. The girls and I had a job to do before the Halloween tradition. For Katherine's Confirmation prep she has a required 20 hours of volunteering to complete. It's not much and her time with the church choir counts (though she still has to find out if practice counts or just the Masses she sings at). The church also provides plenty of opportunities and on the 31st of October we signed up to serve food at the Hilda Barg Family Homeless Prevention Center. For a couple hours we prepped the donated meals, made bag lunches for the following day, then provided for and cleaned up after the current occupants of the shelter. The girls went in costume and handed out little gift bags of candy, and the kids at the shelter were in costumes too. There was so much food and food leftover, some of it was given away, some of it thrown away. When you've live in the Philippines, Togo and India, a visit to a shelter like this one leaves less of an impact. By 8:15 we were home and the girls got their bags and headed out for ToT. That's when the clouds really opened. Over an hour later they had gone through the haunted yard nearby, gotten extra pity candy from the houses they visited and returned drenched through. Apparently it was fun? We'll see if they decide to do it again next year. Weekend Bliss. Wish I'd brought a camera.